Hussein Obama hasn’t yet made a statement regarding the New York, New Jersey and Minnesota terrorist attacks of this weekend, but does it really make any difference? We already know what he would say. It doesn’t matter that the Minnesota knife attack is being claimed by ISIS as having been perpetrated by one of their Somali operatives. His use of the phrase “Allahu Akbar” as he stabbed people, and having asked if a potential victim was a Muslim are completely irrelevant. That attack had nothing to do with the peaceful religion of Islam, we’d be told. It’s also got nothing to do with the fact that Obama is packing terrorists, terrorist sympathizers, and terrorist interns into the US at breakneck speed. As fast as they can give their goats one last kiss goodbye they’re on a plane for America. But this Somali terrorist is different from the rest. He was an anomaly, the rest of them are those peace-lovers we keep hearing about. Then there’s the problem of the bombings, the five heavily-armed suspects arrested Sunday night and the bomb cache that was discovered. They were connected to the bombings, again in a concentration of gay businesses as was the target in Florida and at a Marine run in New Jersey. The military, as in Fort Hood and Chattanooga, is a common target of choice. A third device, a pressure cooker that didn’t go off, had a note written in Arabic attached to it. There’s no need to make a statement because it looks like those perpetrators are Islamists as well. It’s better just to pretend nothing happened and raise campaign money. If they had been white rednecks with their own guns, a Bible and a confederate flag, a live statement from the scene of at least one of the sites would have been in order. Those Americans are terrorists; lone wolves and homegrown. The kind that keep Jihadi Jeh Johnson up at night. Obama would have leapt into action but, as usual, they didn’t fit the regime’s need. Johnson, Kerry and Obama are in the midst of a program to change the face of America to one with a darker complexion and some type of head scarf. They have no interest in bringing negative attention to the very terrorists they are empowering and enriching with American tax dollars. They are their foot soldiers in the invasion, imported as sleeper cells. It’s not time for them or their infidel victims to wake up just yet. Besides, Obama was putting his efforts into the most important aspect of his pretend presidency at this particular point in time, the election of Hillary Clinton to continue his destruction of America. It takes a lot of money to persuade people to vote for an unpopular witch like her, so Obama is fundraising. He’s actually in New York, as fate would have it, another Islamic terrorist, but one with a perfect, airtight alibi. Just ignore the problem, America, and Obama will keep building his army. Go back to sleep. They’ll wake us when it’s time to get in line. 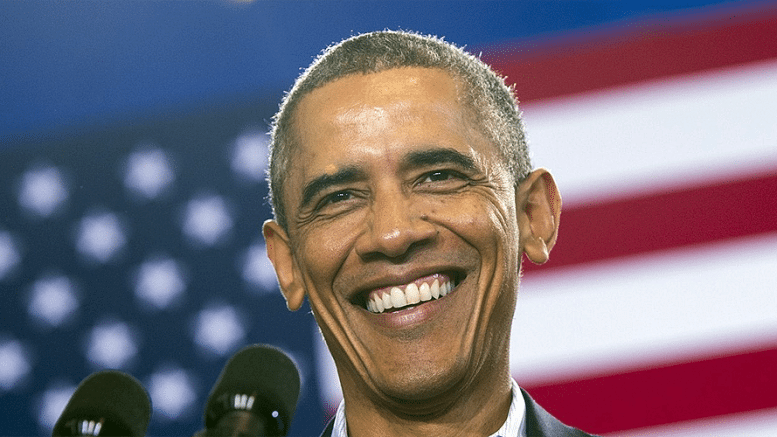 [Watch] Obama Claims His Policy in Iraq is To Prevent a Terrorist Safe Haven – Really?